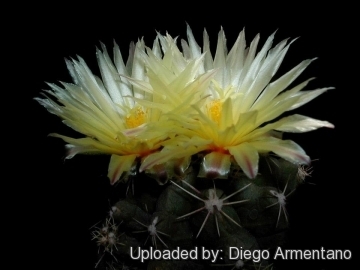 Origin and Habitat: Thelocactus leucacanthus has been reported from Central East Mexico, where it occurs in the states of Guanajuato, Hidalgo, and Querétaro. It is known from 23 subpopulations. Habitat and Ecology: The species grows in matorral and xerophyllous scrub together with Thelocactus hastifer. This cactus is occasionally used as an ornamental. It is relatively widespread and abundant, and is not exposed to major threats, only grazing (trampling) and land-use changes (agriculture) threaten some subpupupulations. 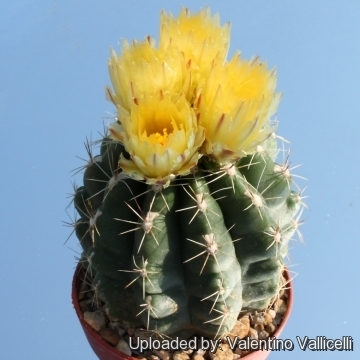 Echinocactus leucacanthus Zucc. in Pfeiff. ex Pfeiff. 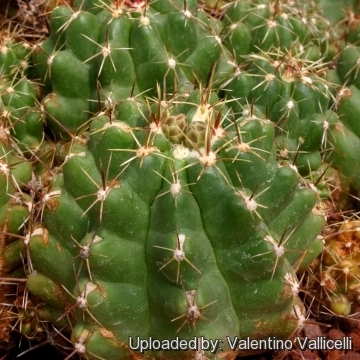 Thelocactus leucacanthus var. porrectus (Lem.) Backeb. Thelocactus leucacanthus subs. schmollii (Werderm.) Mosco & Zanov. 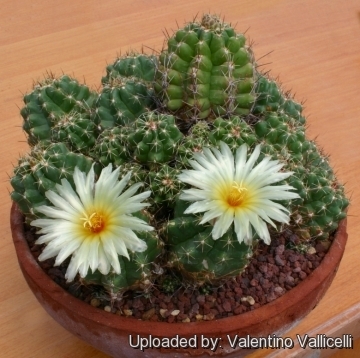 Thelocactus leucanthus var. schmollii Werderm. 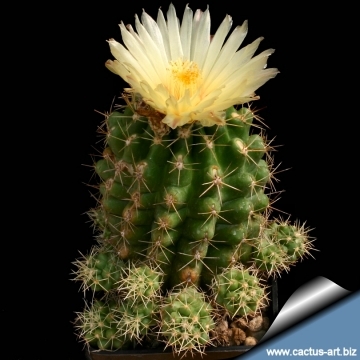 Description: Thelocactus leucacanthus is a cushion forming cactus. It clusters very easily and in the wild it may form groups up to 80 cm in diameter with hundreds of heads. The flowers open on the day and the colour varies from pale yellow to pink depending on the variety and clone. The flowers last for several days but close every night. T. leucacanthus is extremely variable in the number and length of its spines. Stem: Simple then clustering freely, light green globular or short-cylindric, 4.5-15 cm tall, 2.5-6 cm in diameter. Ribs: 7-14 tuberculate but well-defined, straight or sometimes spiralling. Tubercles: Conical-obtuse with rounded tip, 8-11 mm tall,. 10-14 mm wide. Areoles: Elongated 6 x 3 mm wide, spaced 4-6 mm. Positioned on the top of the tubercle and furnished with with nectar-secreting glands. Central spines: Absent or 1, rarely 3, upright-projecting, yellowish-white to almost black , but in age grey, more or less annulate, 5-50 mm long. Radial spines: 6-20 unequal, 5-7 (or more) mm long, spreading or moderately recurved, at first yellowish-white becoming reddish to greyish as they age. Flowers: Diurnal, funnel-shaped 2,5-5,2 cm long, 2-4,5 cm in diameter, the colour varies from pale yellow to pink (or magenta ) depending on the variety and clone. They are produced on the apex of the youngest tubercles and are furnished by scales. Inner perianth-segments numerous, lanceolate, acute. Tube short. Ovary and flower-tube bearing broad imbricated scales. Filament yellowish-green, anthers yellow, style pale magenta with 5-6 stigmatic lobes. 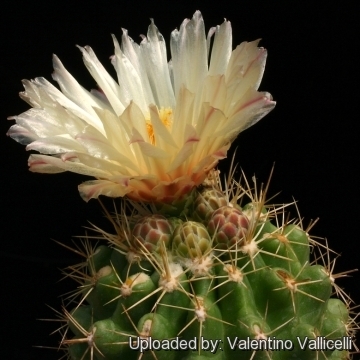 Blooming season: The Thelocactus leucacanthus blooms at the end of spring. Fruit: Furnished of scales, dark green to yellowish sub spherical 6-9 mm in diameter that dry at maturity. Dehisces basally and conserve the floral remnant. Seed: Pyriform black, 1,4-2 mm long, 1-1,8 mm in diameter, seed-coat net-like. 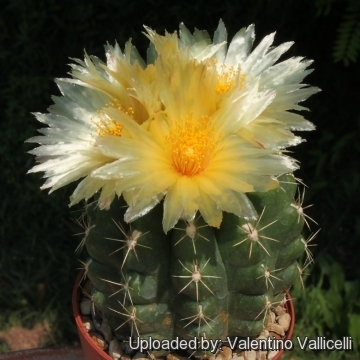 Thelocactus leucacanthus (Zucc. ex Pfeiff.) Britton & Rose: (subsp. leucacanthus) has pale-yellow flowers. Distribution: It grows mostly in Hidalgo. 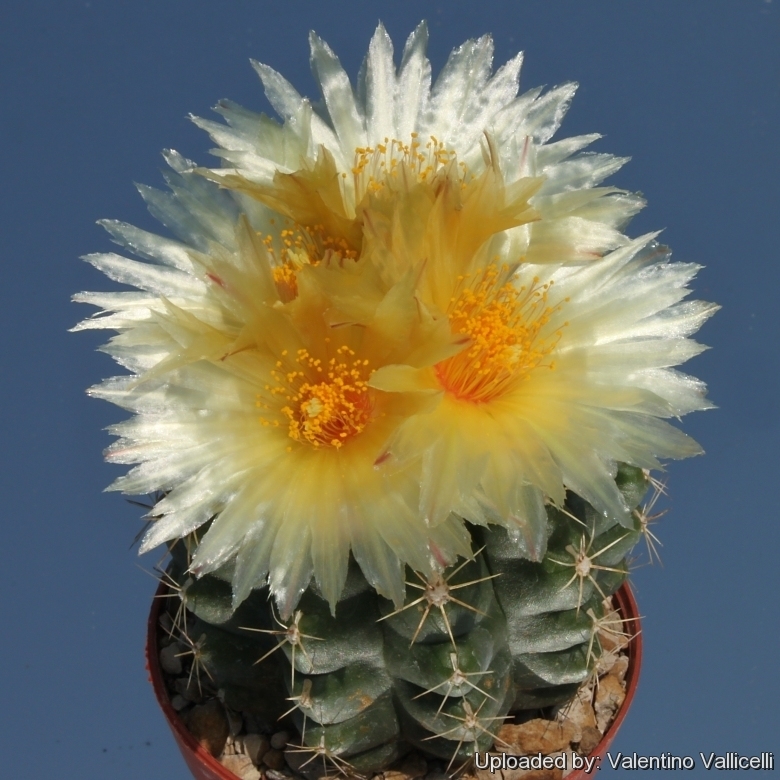 Thelocactus leucacanthus var. ehrenbergii (Pfeiff.) Bravo: same as T. leucacanthus but flowers rose-red. Distribution: Ixmiquilpan, Mexico. Thelocactus leucacanthus subs. schmollii (Werderm.) Mosco & Zanov. : has large tubercles rather than distinct ribs, looks more like a Coryphantha than it does a Thelocactus. It has violet to carmine red flowers. Distribution: Mainly in Queretaro. Habitat: Grows in the xerophytic scrublands in limestone rich substrata at an altitude of about 1200-1990 m.
-1.RLTS.T152346A626445.en. Downloaded on 02 March 2016. Cultivation and Propagation: It is a summer grower species easy to cultivate. Water regularly from Spring to Autumn, but do not overwater, can become too elongated if compost is too rich. Requires full sun or light shade and careful watering to keep plant compact with strong coloured spines. 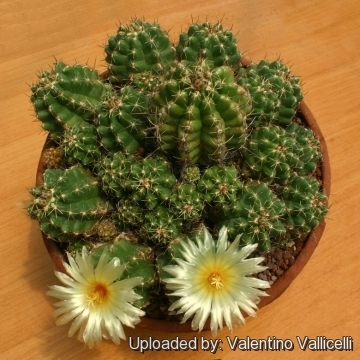 Needs good drainage and very porous potting mix, In Winter, keep dry. Reproduction: From seed or by cuttings as it produces many basal plantlets.